Controversy surrounds two of this week’s new releases. 30 Minutes or Less is a comedic adaptation of a real life situation that ended in the death of a man due to a collar bomb. 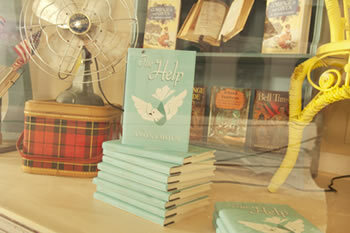 The Help, however, is not based on a true story… or is it? Based on Kathryn Stockett‘s novel of the same name, The Help is set in Jackson, Mississippi during the early 1960s and centers on a white girl played by Emma Stone who returns home from college, determined to become a writer. She decides to interview the black women who have spent their lives taking care of prominent southern families and begins with one woman specifically, Aibileen played by Viola Davis. The story is a piece of historical fiction, but a real-life woman named Ablene Cooper, who said she works as a maid for Stockett’s brother, filed a lawsuit in February that accuses Stockett of using Cooper’s name and likeness without permission. And this is just the start of the controversy now surrounding the just released feature from DreamWorks Pictures. The lawsuit asks for $75,000 in damages and in it says Stockett’s refusal to admit the character is based on Cooper “is so outrageous in character, and so extreme as to go beyond all bounds of human decency, and is utterly intolerable in a civilized community.” Cooper also says she lost a son shortly before going to work for Stockett’s brother, a fact that mirrors Aibileen’s character from the book and film. Stockett was recently quoted saying, “I’ve met this person, I think twice, maybe three times, for ten seconds… I’m confused about where all this is coming from… I don’t know this person.” Additionally, Stockett’s lawyers have given reasons why the case should be dismissed, including claims that a one-year statute of limitations has passed. In the comments on two articles I wrote about the 30 Minutes or Less story which, again, was based on a pizza delivery man that ended up dying when a bomb handcuffed to his neck exploded after he was forced to rob a bank, perhaps willingly but not knowing the bomb was real, people said things such as, “Movie is hilarious. People need to relax.” And, “It’s just a movie.” I wonder, do you feel the same about this case? The controversy doesn’t end there. During the 1960s, the era covered in The Help, legal segregation and economic inequalities limited black women’s employment opportunities. Up to 90 per cent of working black women in the South labored as domestic servants in white homes. The Help‘s representation of these women is a disappointing resurrection of Mammy–a mythical stereotype of black women who were compelled, either by slavery or segregation, to serve white families. Portrayed as asexual, loyal, and contented caretakers of whites, the caricature of Mammy allowed mainstream America to ignore the systemic racism that bound black women to back-breaking, low paying jobs where employers routinely exploited them. The popularity of this most recent iteration is troubling because it reveals a contemporary nostalgia for the days when a black woman could only hope to clean the White House rather than reside in it. Similarly, the film is woefully silent on the rich and vibrant history of black Civil Rights activists in Mississippi. Granted, the assassination of Medgar Evers, the first Mississippi based field secretary of the NAACP, gets some attention. However, Evers’ assassination sends Jackson’s black community frantically scurrying into the streets in utter chaos and disorganized confusion–a far cry from the courage demonstrated by the black men and women who continued his fight. Portraying the most dangerous racists in 1960s Mississippi as a group of attractive, well dressed, society women, while ignoring the reign of terror perpetuated by the Ku Klux Klan and the White Citizens Council, limits racial injustice to individual acts of meanness. Now that is an interesting read and it does raise the question as to how the movie should be made differently or should it simply have never been made at all? Considering the idea at the central part of the story — focusing on a white girl who wrote a book in the 1960s based on the lives of black maids in the South — never actually happened, you immediately have to make the decision whether you are going to roll with this story or not. However, putting aside the fictional aspect of the story, could the same story be told while also respecting the truths of the time? To the misrepresentation of African American speech point, this is an easy fix that could have been implemented and one I don’t believe would have been noticed by any audience members other than those appreciating the fact they didn’t use a “child-like, over-exaggerated ‘black’ dialect” as the ABWH puts it. To the representation of “black male characters” as “drunkards, abusive, or absent”, I can find reasons to argue for and against this point. Arguing for the point, the scenes in which we find out Minny (Octavia Spencer) is abused by her husband aren’t necessary considering the abuse doesn’t have a large effect on the story. It could have been left out and wouldn’t have been missed. However, the ABWH’s decision to use “black male characters” (plural) rather than “character” isn’t entirely fair since there aren’t an abundance of black male characters in the film and, unless I am mistaken, only one is portrayed the way they are describing. Also, this is a woman’s story, one in which men are not a focal point. Yes, when one of the only ways a black man is portrayed in the film is as a drunk and abusive husband doesn’t necessarily paint a pretty picture, but like I said, that is one part that could have been easily excised. The Help‘s representation of these women is a disappointing resurrection of Mammyâ€“a mythical stereotype of black women who were compelled, either by slavery or segregation, to serve white families. The film, on the other hand, makes light of black women’s fears and vulnerabilities turning them into moments of comic relief. The film is woefully silent on the rich and vibrant history of black Civil Rights activists in Mississippi. Based on the above points, the ABWH wanted a different film and a different story, one I don’t think this kind of source material could have provided even if the filmmakers had tried. However, it is easy to understand their point of view. When you see the same stereotypes being used over and over again, in film after film it’s incredibly disheartening. As I was writing my review I tried to consider ways The Help could have been told and actually managed to be the kind of film the ABWH would be proud to support. I couldn’t do it. The instant you center the story around the idea of a “white savior” you either have to go the route The Help went or you have to risk becoming so heavy-handed and sappy no one will want to watch your film. Sure, some of the points raised by the ABWH could have been addressed, but that’s about as far as this specific film could hope to have gone and remained watchable. To tell the story of the maids of the South, you would have to tell the story of the maids of the South, not a story of a young white girl that swoops in to give them a voice they otherwise didn’t have. Everything considered, I do have to say I see The Help coming from a good place, not a place of hate. Perhaps that’s a naive approach coming from a white male, but I don’t view it as a film that necessarily deserves to be attacked. The lines between right and wrong are clearly drawn and ignorant behavior is not rewarded. I wasn’t oblivious to the film’s dodgy narrative when I wrote, “[The Help] proves to be at its weakest in its conclusion, primarily because it never tried to be much more than a character piece,” and I stand by that. I enjoyed the film for its characters and the wonderful actors that brought it to life. However, I think appreciating the film for the talent behind it and discussing the historical accuracy of it are two different things. I guess the biggest question here is whether or not it is okay to enjoy something that deals with and stereotypes such a sensitive part of American history while recognizing its weaknesses? Or, are the fallacies in this case too great to overlook? I’d love to hear your thoughts.